Interstate 85 (I-85) is a major Interstate Highway in the Southeastern United States. Its current southern terminus is at an interchange with I-65 in Montgomery, Alabama; its northern terminus interchanges with I-95 in Petersburg, Virginia, near Richmond. It is nominally north–south, but physically mostly northeast–southwest. While most interstates that end in a "5" are cross-country routes, I-85 is mainly a regional route, serving five southeastern states. Major metropolitan areas served by I-85 include the Greater Richmond Region in Virginia, the Research Triangle, Piedmont Triad, and Metrolina regions of North Carolina, Upstate South Carolina, the Atlanta metropolitan area in Georgia, and the Montgomery metropolitan area in Alabama. I-85 is a route that serves several major locations in the Southeastern United States, stretching from Alabama to Virginia and major metropolitan areas such as Atlanta and Charlotte. I-85 begins as a fork off I-65 in Montgomery. From there, I-85 parallels U.S. Route 80 (US 80) until the highway nears Tuskegee. At Tuskegee, I-85 leaves US 80 and starts to parallel US 29, which the highway parallels for much of its length. I-85 also passes near Auburn, Opelika, Valley and Lanett before crossing the Chattahoochee River into Georgia. I-85 will soon be rerouted southward just east of Montgomery, where it will intersect with I-65 just south of downtown Montgomery. Future I-685 will be the new designation for the route of current I-85, which leads directly to I-65 in downtown Montgomery. In Georgia, I-85 (unsigned State Route 403) bypasses West Point before coming into the LaGrange area. East of LaGrange, I-85 intersects I-185 which connects to Columbus and Fort Benning. 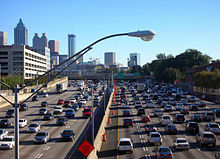 In the Atlanta area, I-85 intersects I-20 and merges with I-75 through the downtown area. North of Atlanta, I-985 provides a link to Gainesville before heading through northeastern Georgia and then crossing into South Carolina. Due to a bridge collapse on March 30, 2017, parts of I-85 in Atlanta were closed. I-85 provides the major transportation route for the Upstate of South Carolina, linking together the major centers of Greenville and Spartanburg with regional centers of importance. In Spartanburg, BMW has a major manufacturing plant that can be seen from the highway. In South Carolina, I-85 bypasses Clemson and Anderson on the way to Greenville. Beginning at Anderson, I-85 widens from four to six lanes. Near Powdersville, US 29 joins I-85 and they run concurrently until they cross the Saluda River. I-85 bypasses just south of Greenville, but provides two links into the city via spur routes I-185 and I-385. I-85 also has direct exits to Greenville–Spartanburg International Airport, which serves the Greenville–Spartanburg metropolitan area. I-85 then bypasses the city of Spartanburg to the north. Its original route is now signed as Business Loop 85 and was approved by AASHTO on April 22, 1995. Near mile marker 70, I-85 intersects with I-26. The exits are signed as exits 70A for eastbound traffic and 70B for westbound traffic. North of Spartanburg, I-85 narrows from six lanes back to four lanes and bypasses Gaffney. Much of the terrain between Spartanburg and the North Carolina border is rural in nature but congested to the state line due to its location near Charlotte. In North Carolina, I-85 enters a relatively rural area near Kings Mountain before entering the Gastonia and Charlotte areas. In Charlotte, I-85 bypasses Charlotte Douglas International Airport and turns northeastward just before reaching uptown Charlotte; thus I-85 just bypasses uptown to the north where it junctions with I-77. North of Charlotte, the highway passes near Concord, Salisbury, Lexington and High Point before reaching Greensboro. At Greensboro, I-85 shifts away from downtown I-85 Business Loop (old I-85 through town). I-85 then joins I-40 east of downtown, and the two highways are cosigned as they pass through Burlington, Graham and Mebane then separate near Hillsborough where I-40 turns toward Chapel Hill, Cary and Raleigh. After the split with I-40, I-85 continues to Durham, before turning northeastward through Oxford then Henderson toward Virginia. Starting from the Virginia border, drivers will pass South Hill and McKenney before heading into a large forest. After the forest, I-85 reaches Petersburg and ends at I-95. The highway is briefly cosigned with US 460 from a few miles west of Petersburg in Dinwiddie County to I-95. I-85 follows the same general path as US 1 (Boydton Plank Road and Jefferson Davis Highway), as the two cross several times between the North Carolina border and the northern terminus outside Petersburg. In the northern half of I-85, the route roughly parallels an ancient Indian trading path documented since colonial times from Petersburg, Virginia, to the Catawba Indian territory. I-85 near Petersburg once formed the southern end of the Richmond–Petersburg Turnpike, which was completed in 1958. The tolls were removed in 1992 after I-295 was completed. Before a 2010 decision to raise the speed limit in the state to 70 miles per hour (110 km/h), Virginia's portion of I-85 was also the only Interstate Highway in the state with a posted speed limit greater than 65 miles per hour (105 km/h). It was raised from 65 to 70 mph (105 to 113 km/h) on July 1, 2006, by the state legislature. In 2004, I-85 was rerouted around Greensboro; and it split with I-40 eight miles (13 km) east of the original departure point. I-40 ran with I-85 along the bypass to the southern/western end and I-40 continued on a new freeway alignment at exit 121 until September 2008, when it was rerouted back to its old alignment through the city. Despite its reroute around Greensboro, the overall length for I-85 in North Carolina remains the same as before. An extension of I-85 has been proposed west from Montgomery to interchange with I-20/I-59 just east of the Mississippi–Alabama state line, where it will connect with I-20/I-59 near Cuba, Alabama. This extension will roughly follow the route of US 80, going through or bypassing Selma and Demopolis. The Federal Highway Administration (FHWA) approved the alignment on February 17, 2011, after the American Association of State Highway and Transportation Officials (AASHTO) approved at its Fall 2010 meeting in Biloxi, Mississippi. Also approved was the proposal to re-designate part of existing I-85 south and east of Montgomery to be bypassed as part of the extension of I-85 as I-685. Alabama has permission to co-sign this part of I-85 as I-685 until the new alignment is built. This section is also envisioned by some as part of a proposed I-14. If this extension were to be completed, I-85 and I-20 would meet each other twice. I-85 is scheduled to have several new auxiliary routes in the future. I-785 is currently planned by the North Carolina Department of Transportation (NCDOT) to run from Greensboro to Danville, Virginia. The proposed route would follow the current US 29 corridor. I-885 is also planned by NCDOT to run from I-40 to I-85 in the Durham area, following NC 147, the under-construction East End Connector, and US 70. There are plans for I-85 from Anderson County to Spartanburg County, South Carolina, to become four to five lanes in each direction including HOV lanes. I-285 near College Park; I-85 intersects this highway twice. I-75 in Atlanta; the two highways run concurrently through much of the city. I-585 near Spartanburg via I-85 Business Loop; An extension is currently underway that will extend I-585 to I-85. I-485 around Charlotte; I-85 intersects I-485 twice. I-40 / US 220 / US 421 in Greensboro; they run concurrently until Hillsborough, North Carolina. I-85 Business Loop in Lexington, High Point and Greensboro, North Carolina. I-85 Business Loop in Spartanburg, South Carolina. ^ a b Adderly, Kevin (February 21, 2017). "Table 1: Main Routes of the Dwight D. Eisenhower National System of Interstate and Defense Highways as of December 31, 2016". Route Log and Finder List. Federal Highway Administration. Retrieved March 21, 2017. ^ Volkert and Associates. "I-85 Extension Corridor Study & EUIS". Archived from the original on December 19, 2008.